It was that time of the year when I started shopping around for new irons, I naturally started with the company that has the reputation for producing the best clubs in the industry. 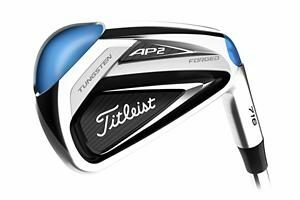 The Titleist 716 AP2 irons are just plain and simply put as, “pure.” As a former Titleist 710 AP2 set owner, I was shocked at the new technology from just a few years difference. The way they feel when you first pick one up, you will feel a solid club in your hands. That solid feeling you might notice right away is because the 716 AP2’s use an average of 56.2 grams of the high-density material in the 3 through 7 irons. Its competitors don’t even approach half of that number. 3 through 7 irons use an industry-leading amount of tungsten to improve launch, ball speed and forgiveness.After taking a few practice swings, then stepping up and hitting solid shot, after solid shot, I felt a certain confidence that I could pick a spot and really go after the pin. It was that reliable in just my short time playing with them. Shiny is an understatement when it comes to the new 716 AP2’s. The club has a nice and thin topline, like traditional bladed irons, but with the appearance of a more forgiving blade. The back of the club shows a diagonally placed back bar with a nice modern touch creating a larger pocket cavity. The 716 AP2’s look fast, controllable and give you a sense of confidence as previously stated.Like any iron, when you hit the sweet spot it feels great. However, with the 716 AP2’s I felt the ball ripping of the center of the club head with a penetrating trajectory. On a miss hit just off the center, I noticed where on the club I missed and saw a very low dispersion rate. Don’t get me wrong, these aren’t the longest clubs I’ve hit, but where they lack in distance, they make up for with accuracy. When I did mishit a ball it still was very accurate, it would come up a little shorter than anticipated. Which is normally everything you ask for in a mishit. You don’t want to see your ball going 40 yards the wrong direction when you don’t hit it on the center of the face.These clubs are helped by the new stock Dynamic Gold AMT (Ascending Mass Technology) shafts, which get lighter by 3g as the irons move down through the set. Having a lighter shaft in the long irons helped maintain distance gapping through the set by accounting for the more frequent mishits via a minor increase in clubhead speed but without losing out on clubface control. 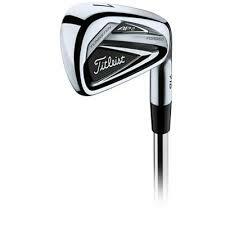 The technology behind the shaft gives longer irons a lighter feel adding launch and speed, while shorter irons have heavier shafts generating better control and distance.If you’re looking for an iron that looks and feels like a true better player iron, but offers forgiveness levels similar to that of a game improver iron, the Titleist 716 AP2 iron should right at the top of your test list. The Titleist 716 AP2 irons not only look great in the bag and behind the ball, but offer performance a whole host of abilities will benefit from, starting with the Tour player down to the mid-handicap golfer. To get such high levels of forgiveness in such a compact head is an impressive feat and the AMT shafts widen what is already a strong appeal. Tour-ProvenTour-proven distance comes from consistent speed. 716 AP2 irons use extreme high density tungsten weighting to position the center of gravity low and perfectly aligned at impact for more speed.Feel & ForgivenessThe most advanced, solid feeling and forgiving Tour played irons we’ve ever made. 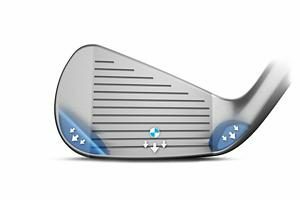 An innovative co-forged construction with high density tungsten low and on the perimeter increases moment of inertia for speed on off-center hits. Player BenefitsSpeed from the high density tungsten, low CG design. Speed on off-center hits from the co-forged high density tungsten weights along the perimeter. Precise, Tour-proven trajectory through the set from the optimized CG progression. Fast through the turf with less dig from the slightly wider sole with trailing edge relief.